A Zanu PF splinter party led by Ambrose Mutinhiri says it will announce its leadership structure after consultations that will ensure it has grassroots support. The National Patriotic Front (NPF), believed to be the new political home for most former Zanu PF members aligned to the vanquished G40 faction, was formed last month, but has kept the nation guessing on big names allegedly backing it. Mutinhiri and national spokesperson Jealousy Mawarire are the only known members and that the outfit is backed by former president Robert Mugabe. But Mawarire said NPF had delayed unveiling its national executive because they had taken Mugabe’s advice on the kind of broad movement that they should establish. “(Former) president Robert Mugabe emphasised the need for a patriotic front whose major anchor is ‘unity, unity, unity’, that is why we are embarking on a national project of a grand nature, one that will bring together as many Zimbabweans from across the political divide as possible,” he said. 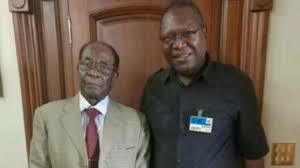 Mawarire and Mutinhiri have been visiting Mugabe at his Harare mansion and the former leader two weeks ago said he would back the new party if it stands for democracy and constitutionalism. “What Zimbabweans need is a patriotic front that harnesses the strength in our diversity, a platform that utilises the different socio-political and economic skills prevalent in our people that can bring about unity, prosperity and development for our country,” he said. “So, yes, we are consulting with other opposition players with a view to making NPF the platform, the glue that unites our people for a common purpose of returning the country to constitutionalism and ensuring we are on an economic recovery path that is imperative in order to arrest the current economic and political decay.